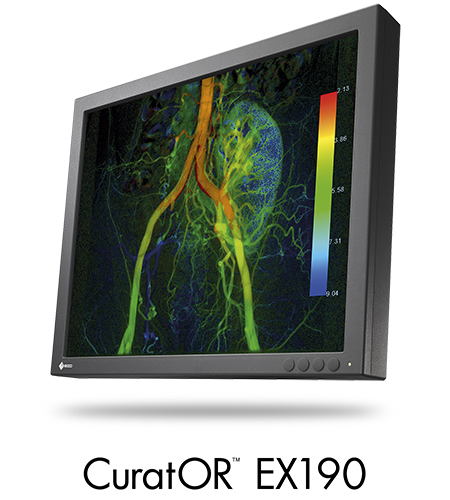 Karlsruhe, Germany, November 12, 2015 – EIZO GmbH is expanding its monitor portfolio by adding CuratOR EX190, a 19" high-brightness color monitor with a resolution of 1280 x 1024 for diagnostics. It is perfect for displaying grayscale tones as well as color images in interventional radiology. The EX190 is designed as an upgrade for the EIZO SMD 19102 grayscale monitor. The use of efficient LED backlight technology allows high luminance, which was until recently possible only with grayscale monitors, to be combined with the flexibility of color monitors. Moreover, the energy-efficient LED backlight is environmentally friendly and long-lasting. The EX190 offers a brightness value of 700 cd/m2 and a contrast of 900:1. The monitor comes in two versions: one without a stand for attachment in ceiling suspensions or as a desktop model with adjustable stand. The monitor is pre-calibrated in the factory and contains five preset look-up tables (LUTs) with practice-oriented settings. These take into account the ambient light introduced with DIN6868-157 (room classes) and therefore meet current requirements for diagnostic monitors. In addition, the EX190 includes an adjustable LUT. This gives users the option of setting their own preferences. The EX190’s blue color point is adjusted at the factory to meet the conditions for typical medical applications and it includes a function for color point adjustment for tuning to user preferences. This gives the user the flexibility to adjust color characteristics of the monitor on site without grayscale losses to ensure all monitors in an installation display images consistently. Adjusting the user LUT and the color location can be done easily via the monitor’s OSD (On-Screen Display) menu without the need for external hardware such as a luminance meter or calibration software. The EX190 can be connected to digital images sources using either the DisplayPort or DVI-I connector. Analog image sources can be connected via the BNC (monochrome) or through the DVI-I connector. The EX190 can also be adjusted to adapt to signals with special timing requirements outside of the standard range using EIZO’s Force Mode function. This function is accessible via the monitor’s OSD menu and helps to provide support to legacy devices and specialized application requirements. Mass production of the CuratOR EX190 is scheduled for the first quarter of 2016. Local availability may vary, so please contact the EIZO subsidiary or distributor in your country for more details. EIZO GmbH is based in Karlsruhe, Germany and is a leading manufacturer of visual display solutions for medical imaging applications. The company’s portfolio includes color and grayscale monitors from 1 to 8 megapixels, image management systems, and accessories as well as individual products and complete solutions for the OR. EIZO GmbH is a subsidiary of EIZO Corporation, a global leader in the manufacture of high-end visual display solutions for medical and graphic applications, air traffic control, and other markets. All product names are trademarks or registered trademarks of their respective companies. CuratOR is a trademark and EIZO is a registered trademark of EIZO Corporation.